Flat Back? Good Idea? How Flat is Flat? Why is there so much insistence on a flat back for a chisel or plane iron? And why do so many people flatten and polish the back of their tools all the way up the back? And why after all that effort to create a flat back are some people are using David Charlesworth's "ruler trick" to create a small back bevel to help with sharpening? The inquiring mind wants to know. Is any of this true? Does it makes sense? 1- There is less sharpening to do if you don't have to polish all that steel away in the middle of the back. and less wear and tear on your stones. 3 - by removing most of the surface area that gets flattened and polished you get more pressure that the contact areas that remain and that means faster working. 4- The sharpening stone doesn't have to perfectly flat as it will still contact the cutting edge before it touches the hollowed out belly of the iron. The best part of this is when you start working the back of a tool you know you will contact the cutting edge right away and get busy quickly. In traditional western tool manufacture (which isn't practiced much these days) grinding the cutting bevel and any side bevels is done after hardening the iron. What the tool maker does is harden the iron, and then check which side has warped a little concave, and then put the bevel on the other side. This gives a subtle concavity that achieves the same goals, abet less noticeably than a purposely hollowed Japanese tool. Unfortunately most modern western tool makers grind and harden in giant batches and have lost the craft that practices the above procedure. The result with a lot of western tools are backs that are bellied which makes for very hard conditioning. Ray Iles, who explained all of this to me, still practices the traditional procedure on his plane irons. Ashley Iles (run today by Ray's brothers Barry and Tony) don't do this on the chisels they make but they intentionally grind their MK2 beveled edge chisels and their American Pattern Chisels very slightly hollow for the same reason. All you need to do with any of these traditionally made tools is initially flatten the back just at the cutting edge. Over time as you sharpen and chase a burr the area that's flat near the cutting edge will recede. The only purpose of a flat back at the very cutting edge of the blade is so that you can chase the burr formed when honing the bevel back and forth until it wears off. 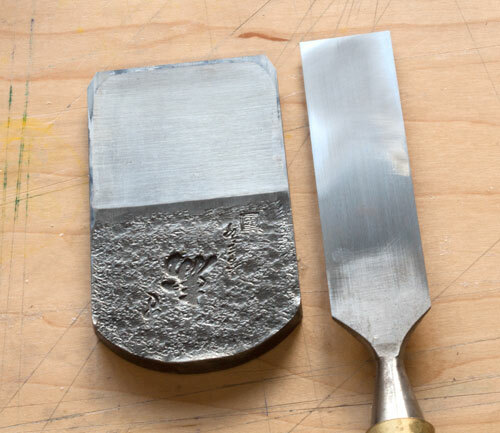 When sharpening the back of a flat chisel against a flat stone the two will stick to each other. Applying pressure and looking for flatness only at the cutting edge will result in less sticking. Since there is less contact with a less than perfectly flat stone, the stone will be more forgiving. If you do try to flatten the entire back of a chisel or iron there is a natural tendency to put more pressure at the tip, so over time the back will become curved. In the case of a tiny bevel created by the ruler trick I don't understand how you easily chase a burr and how you avoid with time having either a bigger back bevel, or having to hone past the tiny bevel. Then why is anyone trying to flatten the entire back of a chisel or plane iron? It gives a better mating surface in a plane. In a bevel down plane it's the front of the iron not the back that beds down and as long as the flatness of the back extends past where the cap iron will make contact you will be fine. On a bevel up plane it might make a small difference in bedding although having a small concavity in the back means that the iron will contact the plane bed most solidly at the cutting edge, and the pressure from the wedge or the lever cap will just improve bedding, especially if over time the bed on the plane becomes less than perfectly flat. A flat back helps guide the chisel. Well considering that thousands of really wonderful, complex joints have been cut with Japanese tools which have a pronounced hollow I'm not sure how useful a flat back is in guiding anything. If you take a chisel and use the back to guide it into the wood, the front bevel will force the chisel to dive deeper and not go straight. The best way to consistently get a chisel to track straight is learn to steer it in the wood (not hard to do). Once you flatten and polish the back you don't have to work on that side again when sharpening. No. What happens when you sharpen is you get a burr that on the back that needs to be worked back and forth until it wears away. If the burr is removed violently you get a rougher, shorter lasting, edge. If you don't work the burr from both sides you get a false edge that doesn't last very long. This is in carbon steel. A2 and other tougher alloys have a tendency to have wire edges that break off easier so I think in the back of my mind that might be one of the appeals of A2 - it seems to sharpen from one side with less work. Flattening the entire back ensures you don't get a ridge in the back that you can get when you just flatten the tip. I don't understand this, and it's never been a problem for me. So in conclusion save yourself a lot of hassle and just make sure the blade is flat for the first 1/16" or so. Note: the picture above shows a Japanese plane iron with a back clearly hollow next to a brand new 1-1/4" Ashley Iles Mk2 chisel. The chisel has had under 100 strokes on a moderately flat 1000 grit superstone. I would normally use a coarser stone to start but even with the 1000 grit there is a small burr on the front already and I am almost done with the 1000 grit. The intentional hollow in the back is clearly unpolished and we have a shiny texture all at the cutting edge. Agree with you 100% Joel. I would never waste my time flattening the entire back of a chisel or plane iron. I think this is just one of those misconceptions that has been (wrongly) repeated so many times it has just become common [bad] knowledge. Thank you for writing about this! I've never understood the "flat backs guide chisel" argument either; anyone who has pushed a chisel knows it wants to dive/undercut, you have to steer it to make it go straight. Wedges just work that way. Doesn't this depend on the direction of the holllow on the back? I recently came into a set of Irwin chisels, unused, as part of a free tool deal. They are all slightly banana-shaped. I do not look forward to flattening those backs! I'm new to the hand tool woodworking world (about a year now) and I've noticed that Sharpening is more of a religious debate than anything else. It confusing for a newbie, and difficult to pick up from all the arguing and fighting about it. I took a class from Rob Cosman on it, and it was (in my opinion) a huge waste of time trying to sell me super expensive tools, and advocating time consuming techniques. (Sorry Mr. Cosman, but that's my thoughts) And I know there are tons of woodworkers who eat that stuff up. It must be our modern mindset, and obsession with perfection (not exactly a bad thing, but maybe the wrong focus?). As a self taught student (with one trip to visit Roy Underhill's school) I have to say the sharpening debates very nearly turned me off hand tools. Just to weigh in on the David Charlesworth mention, the Ruler Trick is never used for chisels. Having read Brent Beach's work on sharpening and honing, you become aware of the phenomenon of wear bevels. The Ruler Trick may go a ways toward dealing with removing the wear bevel, or pulling a sufficient burr on the first of three microbevels. I use a backbevel of 1.4 degrees on my low angle plane blade, and each time I hone it's like the first time, fresh and keen. As far as I am concerned, I am just trying to get two smooth planes to meet at the desired angle to make a sharp and durable cutting edge. We have to consider that there are many different types of chisels for as many types of jobs. For a basic bench chisel the back on needs to be flat enough to support a good and highly repeatable sharpening technique. However, I will spend the time required to flatten mortising chisels, skews, paring chisels and other special purpose tools because (IMHO) it improves the tools performance for that function. I really think it all comes down to considering the task at hand and adhering to a quality and highly repeatable sharpening technique. Worth mentioning that no matter what the method you use to sharpen your chisels or plane irons, they will always benefit from being frequently stropped, (just a few strokes) while you are actually using them. This is all very confusing to home woodworker. What is the standard - it's like the weather in NE, wait 20 minutes and it'll change. I used to think that advice from people who make a living at this would know what they are talking about but now..... who do you listen to and whose advice do you take to heart? I can fully understand how people get confused about this, heck if it's making Joel scratch his head how are the rest of us mere mortals supposed to cope! The answer is that there are some applications where a 'flat' back is of benefit - paring with the aid of an accurately prepared guide block for example. With Japanese chisels the registration surface has a hole in the centre but the same applies to what's left. Absolute flatness is a concept and everything, including straight edges and granite beds approach it to a tolerance, usually expressed as plus or minus an amount relative to a centreline. If your chisels are prepared flat with a unilateral (one direction only) tolerance for hollowness of 2 thou or less they will behave, from a working perspective, as though they are flat. When you come to sharpen them however, you will find that the underside of the cutting edge can be polished in a matter of moments. With the correct honing technique, longditudinally hollow ground backs will tend towards but never quite reach absolute flatness. Convexity on the other hand will continue to get worse until you grind it out. I believe that by grinding their chisels to this specification after hardening, Ashley Iles are achieving far greater consistency and finer tolerances than were ever achieved by the old method described above.